There’s a lot going on in downtown Fort Wayne these days – so much so, in fact, it can be hard to see all the activity as part of a greater vision. Our friends at Greater Fort Wayne Inc. turned to us to help share that vision – and inspire our city. Working closely with the outstanding team at GFW Inc., we pulled from all areas of our agency’s expertise to produce “Opportunity on the Edge of Greatness” – a campaign and video that focused on the plan, the purpose and the people of our community. Using drone footage and 3D mapping, we pinpointed exactly where each of the downtown’s five key developments will take shape. These five attractions – the downtown event center, The Landing, Riverfront Promenade, GE Campus and STEAM Park – will turn historic Fort Wayne staples into areas of entertainment and community involvement. Highlighting the success of recent expansions such as the Tincaps Stadium and the renovation of the Embassy Theatre evidenced the supportive, thriving nature of our downtown – and how much potential it still offers our city’s future. A project for our community is one we’re grateful to put our name on. And although it’s a long-term plan, it’s been a long time coming. For the recreational vehicle industry, the National RV Trade Show each year in Louisville is a Really. Big. Deal. And we were excited to once again help our friends at Freightliner Custom Chassis Corp. stand out in a Really. Big. Way. The National RV Trade Show is a prime and important opportunity for FCCC to demonstrate its latest products and promote coaches coming to market in 2017 built on its luxury diesel chassis. For this year in particular, Freightliner had two objectives: 1) showcase their impressive new innovations and technology exclusive to FCCC; and 2) introduce the new messaging they’re gearing towards in 2017: “Backed by Daimler. Grown in Gaffney. Driven by You.” – the three pillar statements encompass the foundation, history and mission of FCCC. Months of conceptualizing, planning and teasing the launched through trade publications and select events led us to bring this year’s booth to life. This included a 360-degree virtual reality experience that gave viewers a lesson on the detail, comfort and convenience of FCCC, as well as a hands-on interactive display to unveil the new Key FOB capabilities. We also had some thematic fun – some Daimler engineering in the form of a 2016 Mercedes Maybach next to some American muscle in the form of “Problem Child,” a 1970 Plymouth GTX painstakingly restored by an FCCC employee. Both were huge draws to the booth – and the VR and interactive displays kept them there. In addition to the comprehensive booth presence itself, we generated awareness of and excitement through trade advertising in the show-preview issues of industry publications, as well as dedicated public relations and social media efforts. Overall, the show was another huge success for FCCC, helping ensure it hits 2017 at full speed. For any organization, a successful annual report does more than tell the financial story of the year – it also tells the stories of those who’ve helped make the past year possible. Once again, we were honored to help our friends at Do it Best Corp. tell the story of their successful year – and of the members they helped grow and succeed. After helping the co-op celebrate its 70th anniversary in the home improvement industry with a look back in 2015, we wanted the 2016 report to look forward. Framed around the theme of “Dream. Build. Grow,” we shared stories of how Do it Best Corp. – the largest privately held company in the state of Indiana with annual sales of $3 billion – helps its thousands of hardware store, home center and lumberyard member-owners throughout the United States and in 52 other countries grow their businesses and achieve their dreams through a comprehensive menu of programs and services. We traveled to member locations throughout the country, capturing and sharing their entrepreneurial success stories – and how their partnership with Do it Best Corp. helps make it possible. With the co-op’s trademark hammer on the cover, this year’s annual report drives home the achievements and accomplishments of its members and how their co-op partnership gets stronger year after year. While they provide fresh-picked produce, gourmet cheeses and delicious baked goods, the greatest, most beneficial things Kroger supplies its communities with can’t be put on a shelf or bought in a store. Each year, we work with Kroger’s Central Division – which covers 136 stores in 5 states – to produce their Community Report, which details all the ways the company works to make a positive impact on the populations and communities it serves. This year, we focused on the stories – their partnerships, sponsorships and relationships. 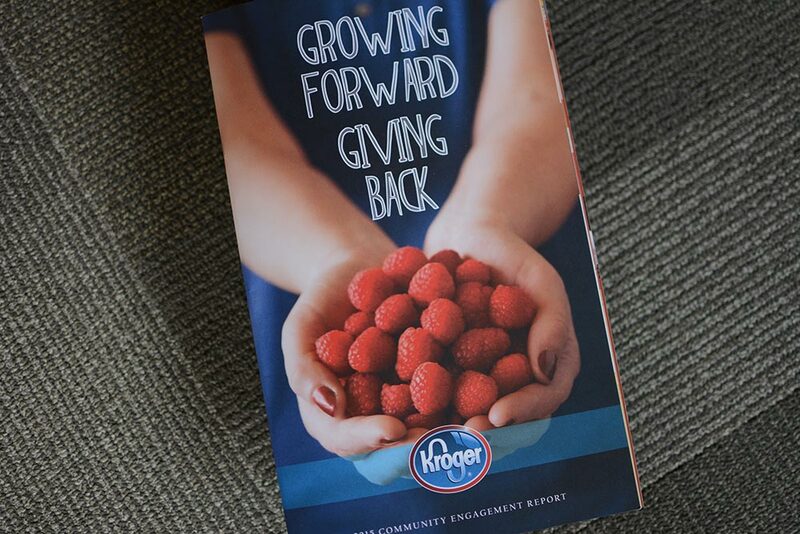 We used their 2015 Community Report as a symbol of the hard work and dedication each Kroger employee puts forth every day in making their communities stronger and more connected. As most organizations would love to boast their commitment to their communities, you can’t fight facts – and highlighting the multiple ways Kroger went above and beyond in its previous fiscal year came easy. In 2015 alone, Kroger Central Division invested $13 million in its local communities through hunger relief, K-12 education and additional initiatives. Sure, Kroger is your neighborhood grocery store – available for all your kitchen and pantry necessities – but it’s much more. Behind the shelves, Kroger operates and thrives as a vital part of each town and city in which they are located – including our own. Although many of their most honorable efforts go overlooked and unheard, they continuously work, day in and day out, to ensure they have a positive, long-lasting impact in each and every community they serve. Earlier this year, our friends at the Fort Wayne Children’s Zoo unveiled some awesome additions and updates to its Australian Adventure exhibit. They asked us to help showcase the incredible Australian Adventure to the community – and demonstrate how it brings kids’ dreams to life. The concept for the 30-second TV spot we created begins with actual artwork from local children in which we asked them to draw what came to mind for the Australian outback. We then took those masterpieces – and the kids who created them – and used the spot to highlight the Australian Adventure’s many new and updated features, including the Reef, Stingray Bay, River Ride, kangaroo colony and three new aviaries. The spot captures all of the Adventure’s many new aspects while also demonstrating it captures the Australian-themed imagination of kids of all ages. As the Zoo closes in on the close of another successful season, the Australian Adventure has been a huge hit and popular attraction. We are thrilled with how the spot turned out, and love seeing the new Australian Adventure have an impact on the Zoo as big as the Outback itself. Founded in 1943, STAR has grown to become one of Indiana’s largest privately held community banks. Even as they’ve grown and expanded their footprint throughout the state, they’ve stayed true to the mission and values they were founded on – which is increasingly rare and refreshing in a rapidly changing industry. We are honored to serve STAR as its agency of record and were thrilled to begin developing a comprehensive, multi-channel marketing campaign earlier this year. 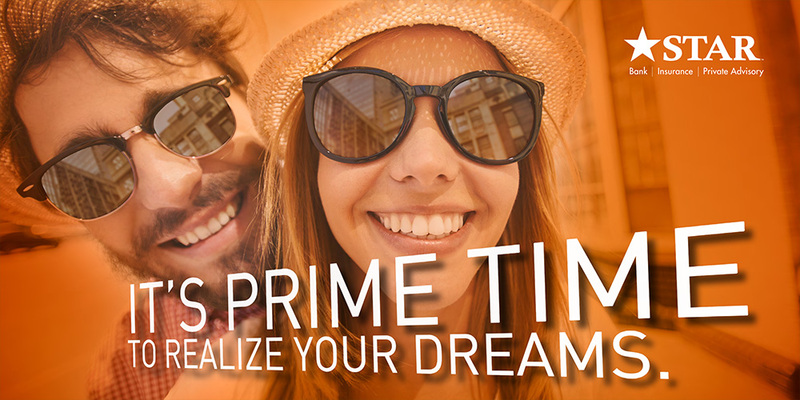 While telling the unique STAR story and underscoring its local roots and personalized customer experience, the campaign also acknowledges that today’s consumers are changing. So while the campaign has its foundation in traditional avenues like television, and outdoor, it also employs an innovative range of digital touchpoints as well, including via social media and other strategically targeted platforms. While the touchpoints differ, the message is consistent: Thanks to its history and its values, STAR is uniquely positioned to treat its customers like family. Indeed, the campaign is building brand awareness and showing communities they can “Come home to STAR” and that #STARBankcares – using these slogans and hashtags throughout ads and social media posts and promos. Want to know something agencies struggle with all the time? It’s “practicing what we preach” – getting so busy on behalf of clients that we fail to prioritize our own marketing and positioning. As we continue to grow our digital offerings in particular, we realized the time had come to practice what we preach online. Developing websites is a unique challenge – finding that harmonious balance between information and aesthetics, details and design. We wanted our new site to showcase who we are, most importantly through what we do – bringing our work front and center. We also wanted it to be easy to navigate, responsive and beautifully designed (of course). 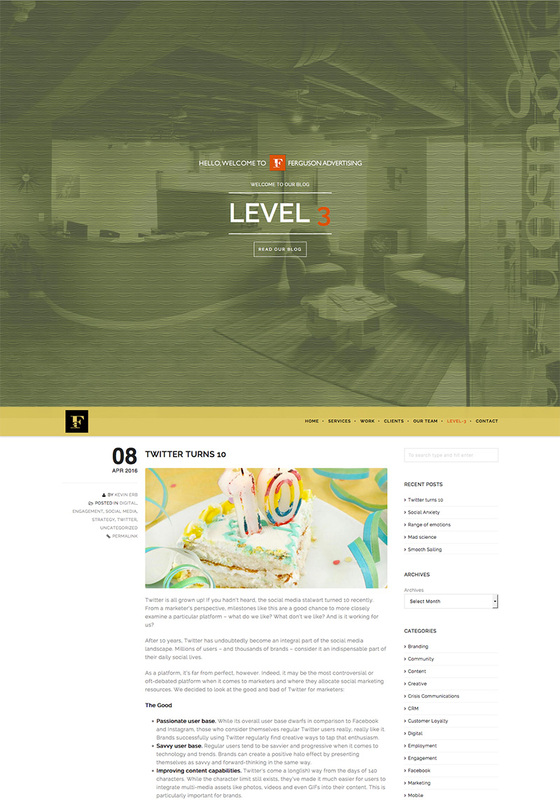 Lastly, we wanted to create a centralized location that pulled in our entire active social media presence. The result? Well, we’re a bit biased, of course, but we’re quite proud of the new fai2.com. By putting our work front and center, it’s helping us practice what we preach – and preach what we practice. 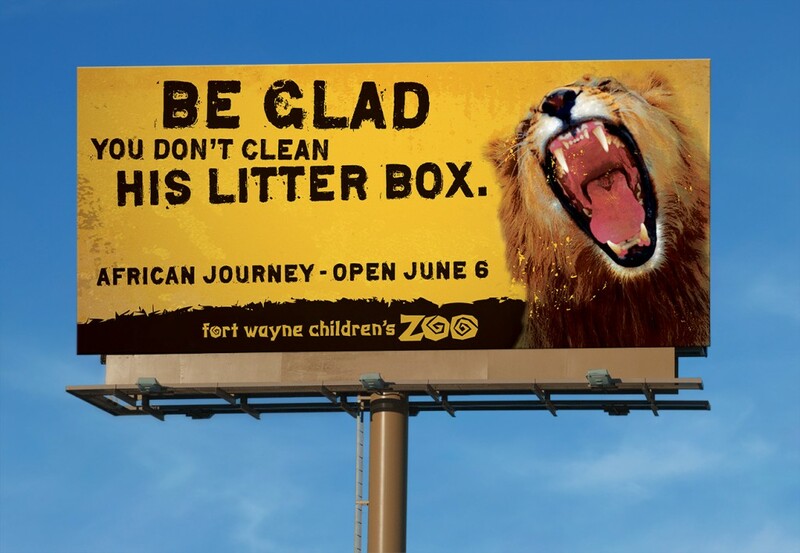 Like many of you throughout northeast Indiana, we were very sad to hear of the passing of Fort Wayne Children’s Zoo beloved Bill the Lion recently. We’re fortunate to call the Zoo a longtime client, so we found ourselves in a unique position to pay tribute to Bill in a special and memorable way. As you may expect, Bill was featured often in our work for the Zoo, so we decided to pull much of that work together for a little tribute. Bill captured our hearts, and he was one of the most popular attractions at the Zoo – he will be greatly missed. 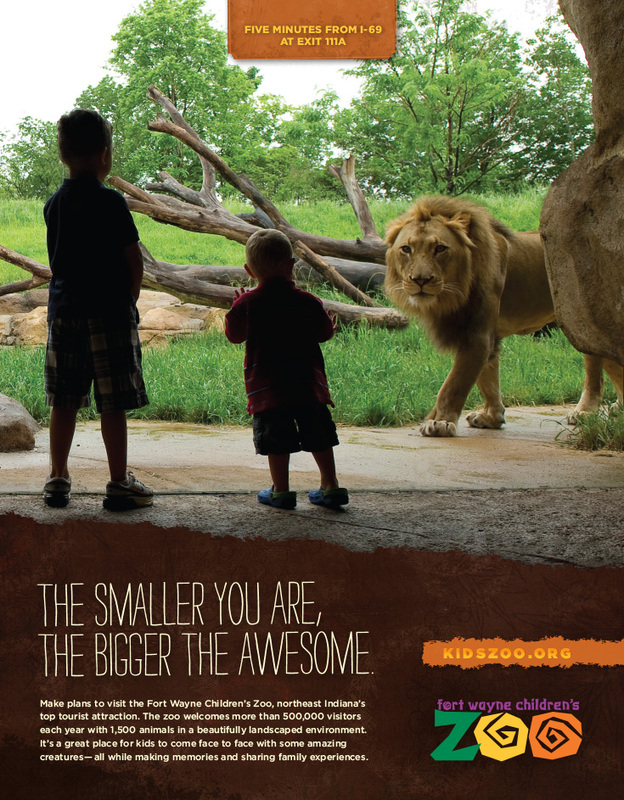 Here’s a look back on our work featuring the King of the Fort Wayne jungle. The Dekko Foundation was founded in 1981 with a mission to foster economic freedom through education, thanks to Mr. Chester E. Dekko. 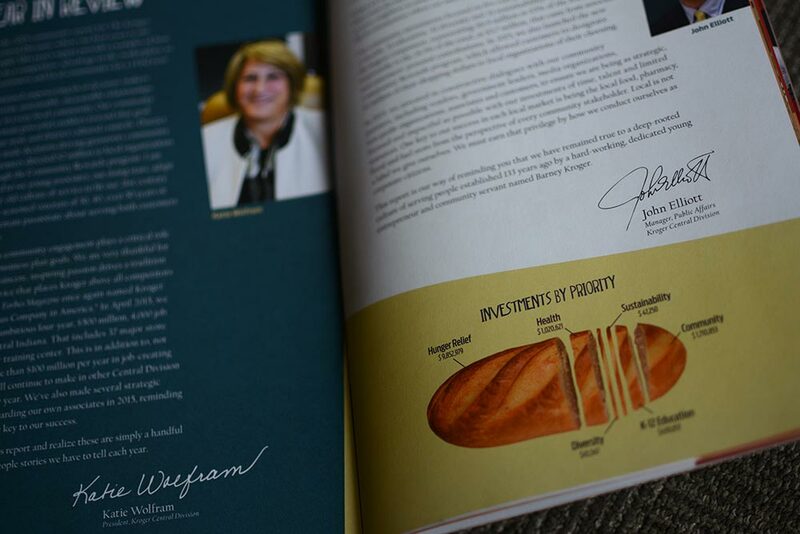 They believe they succeed in this mission when they produce more than one consumes – and they came to us with this concept for their 2015 annual report. As strange as it is, I Love Lucy was the answer! 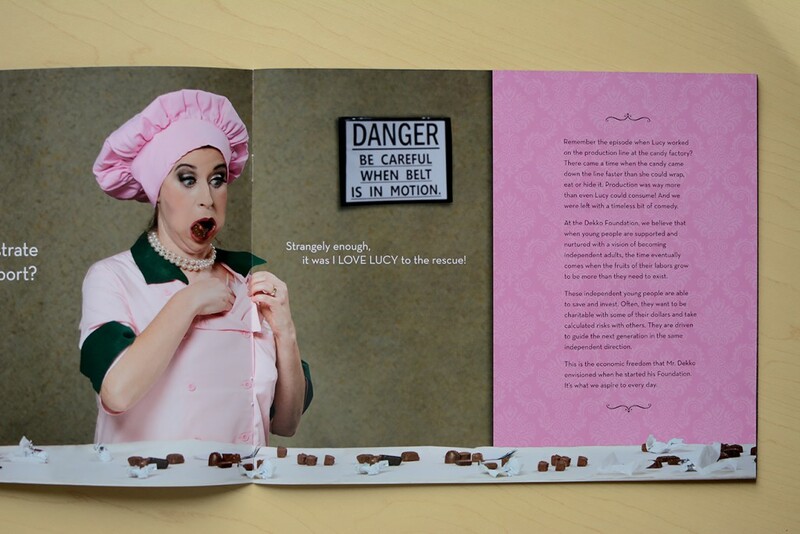 Everyone remembers the infamous episode of Lucy taking over the production line of a candy factory, and failing miserably at keeping up with the fast pace wrapping the job requires. The result was an unforgettably hilarious scene of Lucy stuffing her pockets, shirt, mouth and everywhere else with excess candy pieces – a production far more than she could consume. Just as Lucy was surrounded with more candy than she needed, the Dekko Foundation works to surround young people with such nurture, support and vision, they will all succeed in saving and investing. Dekko came to us with this incredibly creative concept, especially once it was brought to life by the Foundation’s “Lucy” (Jana Leitch – a volunteer connected to the Foundation), who captured the character’s quirky demeanor and made each step of our goal feasible and believable. What started as a loose concept became a reality that perfectly expressed the Dekko Foundation’s mission in a relatable, entertaining manner. 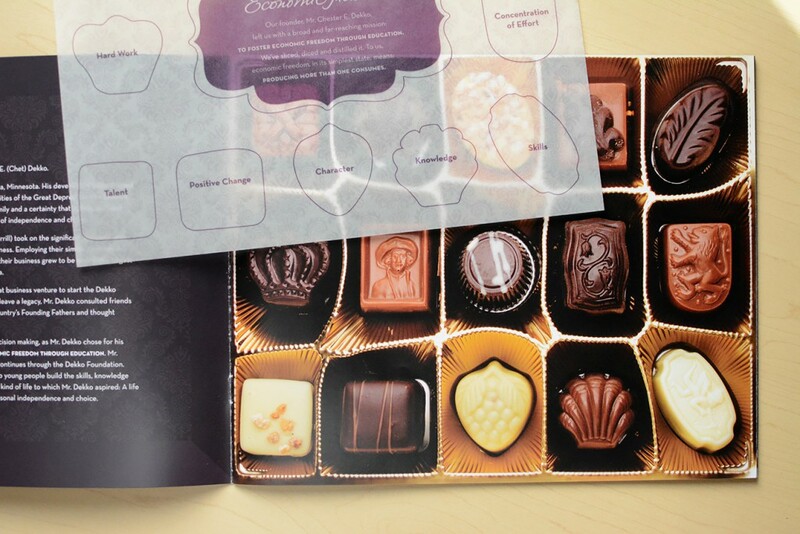 You know they say life is like a box of chocolates – except with Dekko, you know exactly what you’re going to get.